"Gene nt-Nha had 35% identity to the shaA (mrpA) gene of Clostridium tetani. 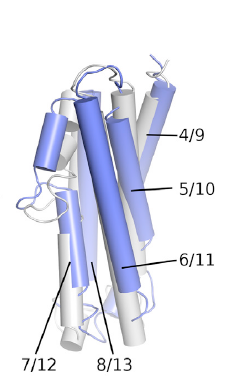 The Mrp proteins belong to the monovalent cation/proton antiporter-3 protein family. ...Sequence analysis of the regions surrounding gene nt-Nha, however, did not show that it was part of an operon. This indicates that gene nt-Nha does not encode a subunit of an Mrp system, but rather a mono-subunit antiporter". As you can see it is a double channel and it is homologous to NouL from mammalian (and others) complex I. The two marked amino acids are a glutamic acid and a lysine which are conserved in NuoL. 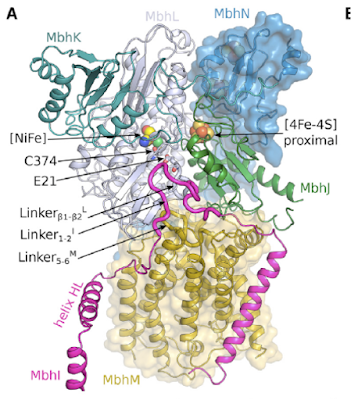 I would guess that the left hand channel is the proton channel and the right hand one is for the antiported Na+ ion. 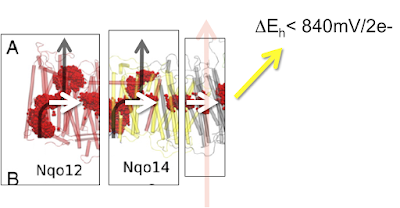 In the modern bacterium N thermophilus this antiporter is electrogenic, ie it moves more than one H+ inwards for each Na+ outwards. This may or may not have been the case in LUCA. 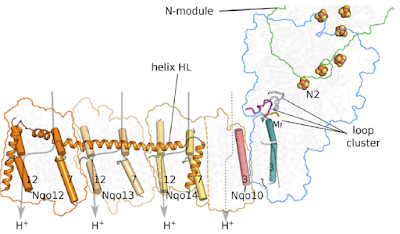 So nt-Nha looks a lot like NuoL and so quite like NuoM and NuoN (and MrpA, MrpD and MbhH) but it is the only one to antiport. The antiport mechanism really hasn't been worked out yet. Half of NuoL is structurally pretty well identical to NuoH. 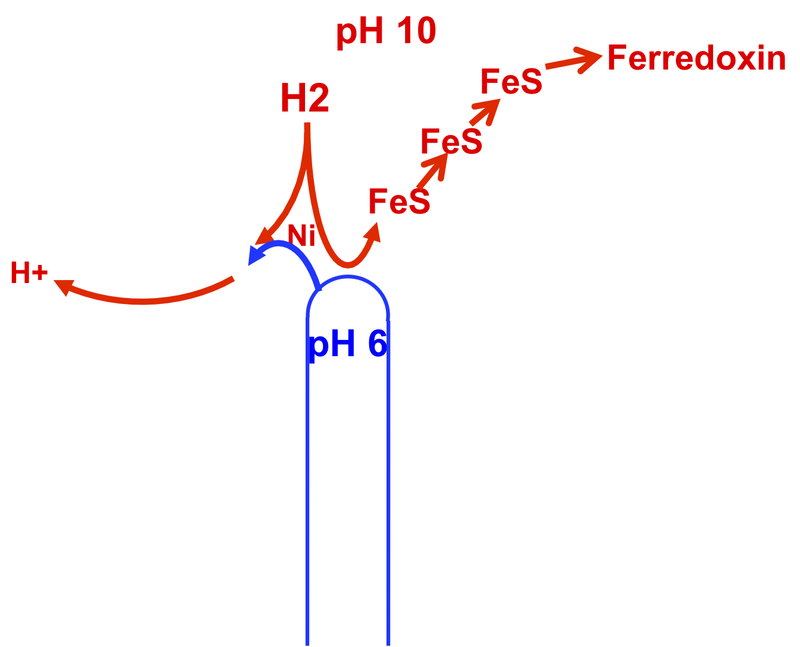 From the proto-Ech posts I consider NuoH to be derived from the primordial channel designed to allow oceanic pH penetration in towards the NiFe catalytic site (at alkaline hydrothermal vent pH) to generate reduced ferredoxin as the core power molecule of early LUCA, able to reduce CO2 to CO at the CODH/ACS complex. So a derivative of the ancestral proton channel formed half of NuoL. 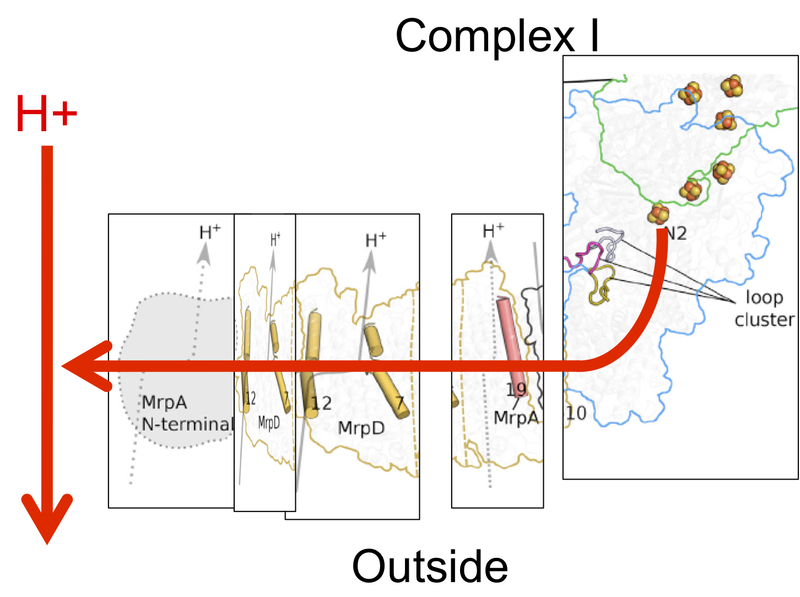 I think it is very likely that this is the case for all of the "antiporter-like" subcomplexes, though clearly some changes in function have occurred. What made up the other channel of the ancestral antiporter? For a clue as to this one we have to change subunit and change nomenclature. The work has not been done for NuoL but it has been done for the membrane bound hydrogenase of P furiosus (subunit MbhH) which is structurally more closely related to NuoN rather than NuoL. So the right hand side of MbhH is simply the inverse of the left hand side. 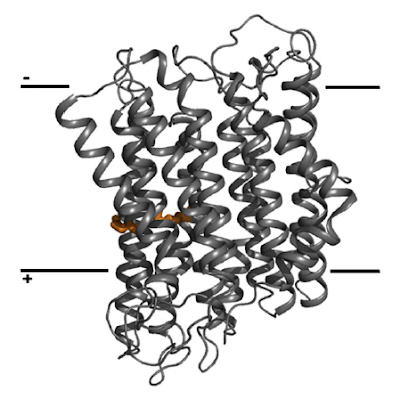 We only need one protein, the original ancestral proton channel, to make both sides of the original ancestral antiporter. Minor modification would allow one side for H+ and the other for Na+. Then some sort of coupling to convert H+ in to drive Na+ out. 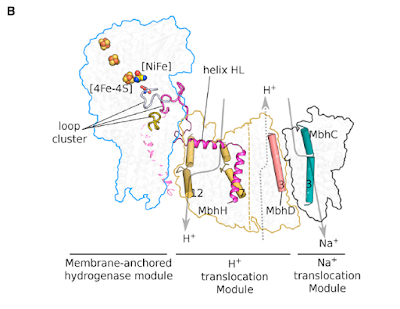 But basically we can make all of the modern "antiporter-like" subunits from an ancestral derivative of two conjoined NuoH-like channels. That is so neat it has to be correct. So it's probably wrong! That coupling process might be extractable from work being done with modern complex I but I have only skim read the paper so far, so I'm not sure how much further I can progress the current fairy tale. Life (26) MrpA MrpD NuoL NuoM and NuoN. Plus nt-Nha. In brief they had Bacillus subtilis strains with either an MrpA knockout or an MrpD knockout. The E coli complex I equivalent of NuoL can replace MrpA and the NuoN equivalent can replace MrpD in B subtilis. NouM doesn't seem do either. But all five subunits look very similar to each other and all are clearly related. 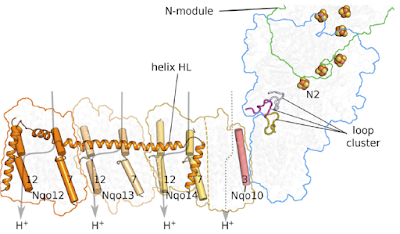 NuoL, NuoM and NuoN are always described as "antiporter-like". MrpA and MrpD are thought to be antiporters but none ever work alone, the whole complex is needed, so they are probably "antiporter-like" too. They all appear to have been derived from an antiporter but any intrinsic antiporting has been lost. Which makes me sad because it seems very probable that all of the above subunits are derived from the primordial antiporter at the origin of life which initiated Na+ bioenergetics and all that followed on from that. 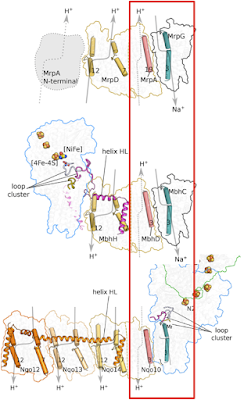 regions surrounding gene nt-Nha, however, did not show that it was part of an operon. This indicates that gene nt-Nha does not encode a subunit of an Mrp system, but rather a mono-subunit antiporter". EDIT number 2: These people have isolated an MrpA from an archaeal species which will antiport on its own, which makes it very similar to nt-Nha. 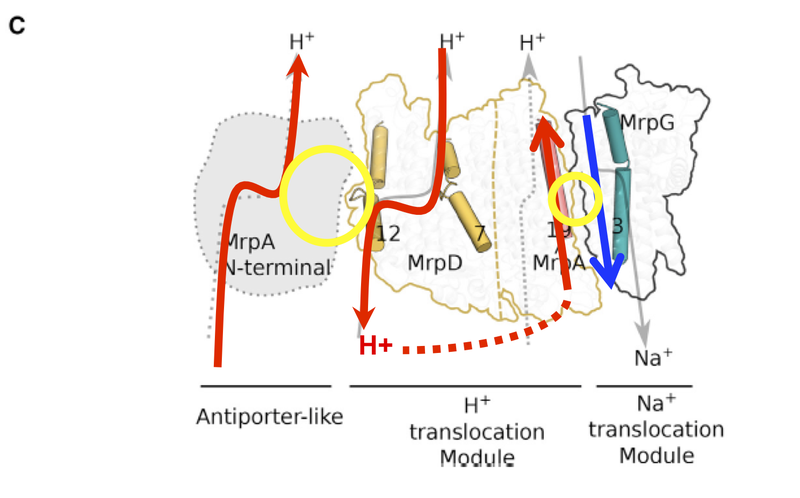 There is also some evidence that complex I can function as a partial Na+/H+ antiporter as in this paper. NuoL is the main suspect. END EDIT. 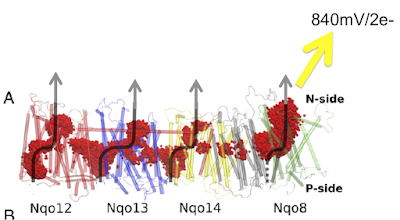 Neither the MrpA-like nt-Nha nor the modern MrpA subunit of C tetani is in any way primordial. 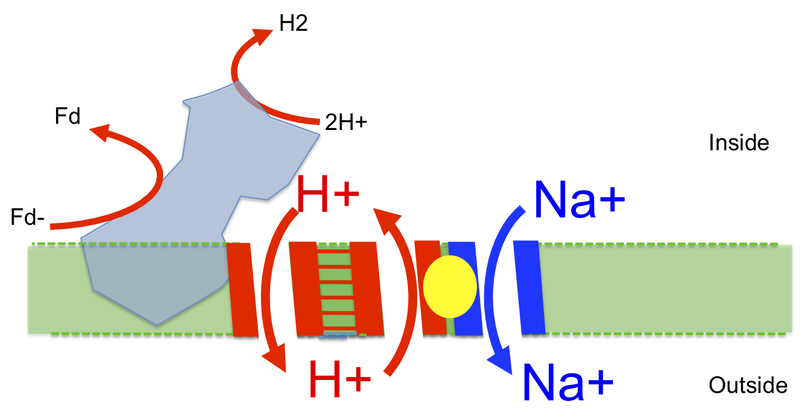 Both are used to extrude Na+ in exchange for H+ but this is not to drive Na+ energetics, they are much more associated with resistance to high Na+ concentrations and to alkaline pH environments. 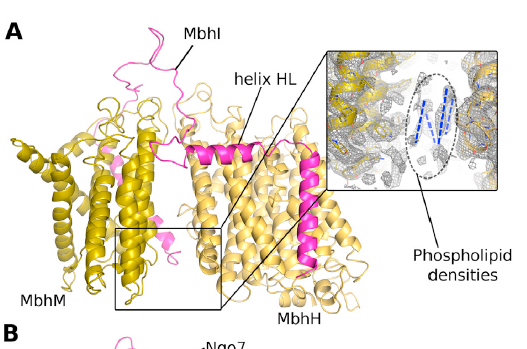 So it is possible that the N Thermophilus nt-Nha is a relatively modern derivative (it does use a proton tight membrane) of a relatively modern MrpA. Or, more excitingly, it's possible that an ancestral Na+/H+ antiporter gave rise to both nt-Nha and MrpA. This would be the interesting option as it is possible that the Na+ binding sites, the route across the antiporter for Na+ and the mechanism for activation might just give us the technique used by the original ancestral antiporter. Genetics and structure-function modeling look to be the way to go but I can't see that it's been done yet. Edit: Found the structure homology studies in here, lying around on my hard drive for years too. End edit. Labels: Life (26) MrpA MrpD NuoL NuoM and NuoN. Plus nt-Nha. Life (25) Left or right hand? I've squeezed in an extra MrpD because that's what complex I appears to have done as a modified duplication of either MrpA or MrpD. 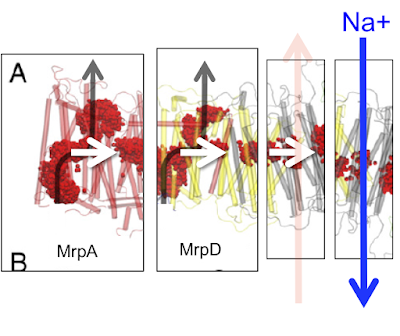 In mammalian mitochondrial nomenclature the MrpA N-terminal derivative is NuoL, the narrowed (only in this image, not really) MrpD gives NuoM and the full sized MrpD is NuoN. Yu et al only use the bacterial complex I terminology based around the Nqo numbers. I've avoided these numbers (just used the Mrp terminology throughout the doodles) as the switches from terminology to terminology did my head in (as we say here in Norfolk) for weeks. MBH, Mrp and Nqo. Alphabet soup for the subunits! But the core insight for me was that if you supply power from the left you pump Na+. Supply it from the right and you pump protons. This looks very much like motorising Mrp from one end makes it work in the Na+ extrusion antiport mode. 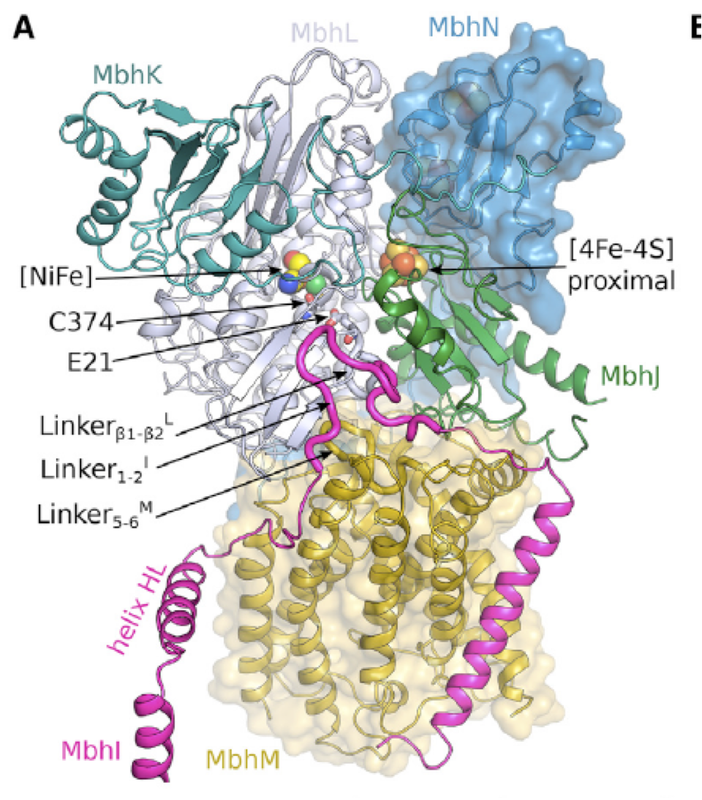 Adding the power source to the opposite end, coincidentally removing the Na+ channel at the same time, drives the antiporter in the H+ expulsion direction, reversing the primordial function of Mrp and so forming the origin of the complex I family. Obviously there is nothing primordial about complex I. 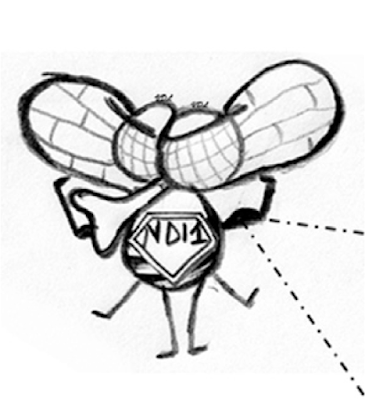 It is reliant on a proton tight membrane and the ability to extract large amounts of energy from NADH, which usually means the presence of molecular oxygen. The least altered representative of antiquity is undoubtedly the MBH of P furiosus and even more so is the ancestor of the Mrp antiporter family. Labels: Life (25) Left or right hand? I notice the EU is considering approval for a plan to enforce removal of copyright infringing images form pretty well everywhere on T'internet. Over many years I've felt that this sort of action would clearly be the end of Hyperlipid as any of us knows it. I back up every month or so to keep my ideas safe for myself but if Hyperlipid suddenly disappears I think everyone should have an idea as to why. This will be it. Anyway, for now something resembling normal service will be resumed when I can tear myself away from Mrp antiporters and derivatives, which is proving rather difficult. Personally I have no issue with the two concepts being complementary. Carbohydrate in quantities which get glucose past the liver will drive up systemic insulin. Omega six (and 18C omega three) fatty acids will make adipocytes hyper-respond to the obesogenic signal of elevated systemic insulin. Fat (largely dietary sourced) is then lost in to adipocytes. Loss of this fat is the equivalent of not having eaten it, so you are left hungry. It's the old weight gain causes hunger paradigm. I like it. 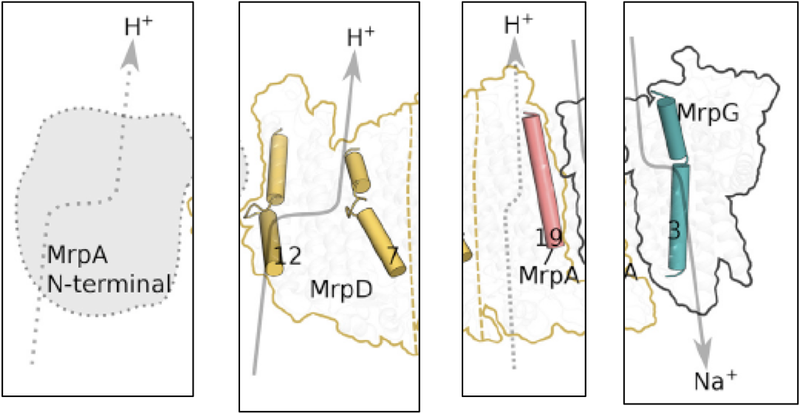 Just to summarise: The membrane bound hydrogenase (MBH) of Pyrococcus furiosus pushes a proton outwards through a proton permeable membrane which then returns through a subunit of MBH which looks very much like three quarters of the Mrp antiporter. 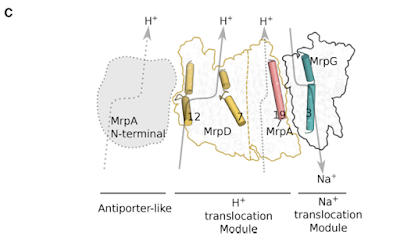 The Mrp antiporter is derived from a very, very ancient antiporter which appears to have been one of the core systems of the last universal common ancestor (LUCA). Which ion travels in which direction in the modern families of Mrp is currently not particularly clear and may depend on all sorts of factors. 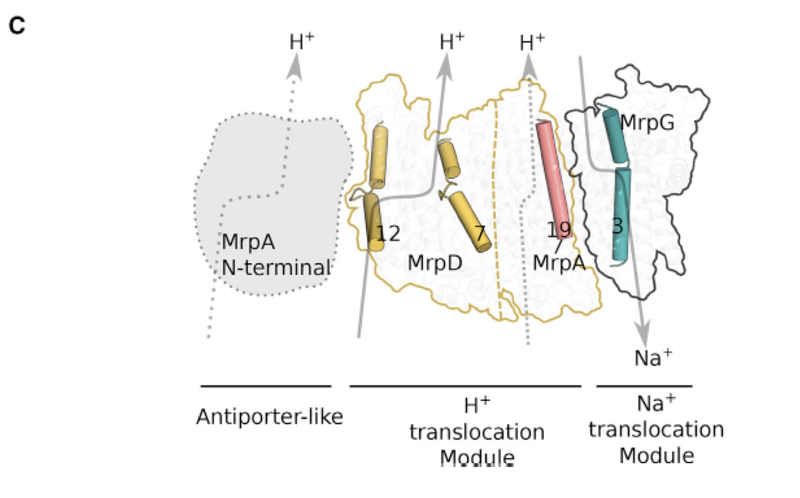 OK.
No one has worked out the detailed structure/function of the Mrp antiporter, but there is a very interesting paper from back in 2001 which might give us some insight about function at least. 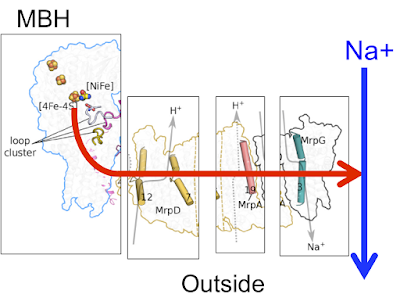 The study used modern E coli whose plasma membrane is tight to both protons and Na+. A strain with all of its antiporters deleted was used and then plasmids were engineered to supply a single gene antiporter of the nahA type (also from E coli) or an Mrp from Bacillus pseudofirmus OF4 (yup, that's its name) or one from Bacillus subtilis. Respectively we have strains ending in -118 endowed with the blank plasmid, -nhaA for the monogenic antiporter, -BSmrp (B subtilis Mrp) or -OFmrp (B pseudofirmus Mrp). They stuck the engineered E coli in to 25mmol of NaCl, fed it and looked at the intracellular Na+ concentration. Very simple. The first two columns are exactly what you would expect. Having no antiporter gives an intracellular Na+ in equilibrium with culture medium Na+ at around 25mmol, near enough. Any antiporter rescues this, the nhaA monogenic antiporter somewhat better than either of the Mrp antiporters. Now here comes the clever bit. They added CCCP, a classical protonophore which drops the membrane potential from 150-ish mV to 15-ish mV (obviously the membrane voltage should be zero but the E coli complex I will be working flat out to stop this fatal occurrence plus I suspect the dose of CCCP used was less than supramaximal, though I've not checked this), and then they looked at the intracellular Na+ concentration. So they have suddenly converted a modern E coli to an E coli with a proton permeable, Na+ impermeable cell membrane. Like Pyrococcus but without the boiling water. Or like LUCA. Both organisms to which Mrp antiporting is/was very important. 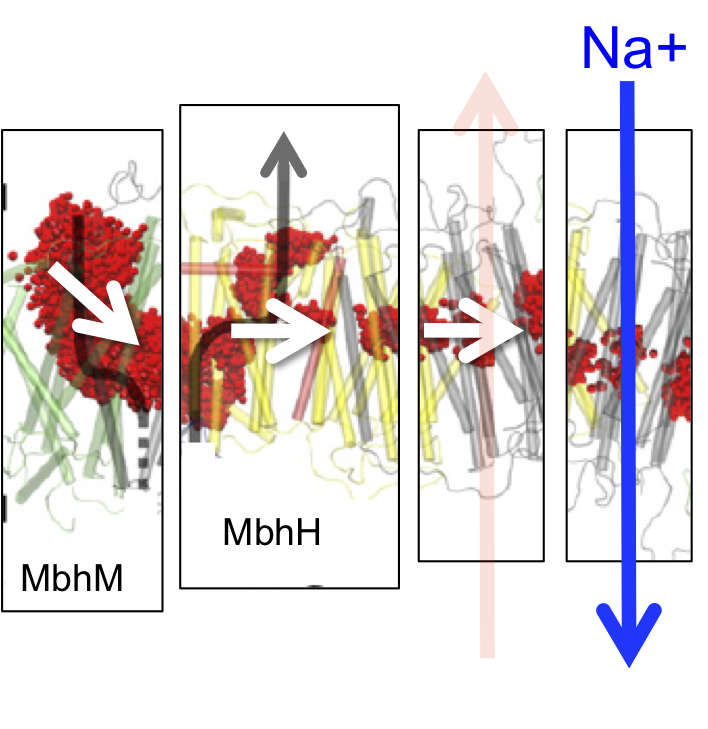 The simple nhaA is utterly dependent on a proton tight membrane with a transmembrane proton gradient and it fails to antiport anything in the presence of CCCP, as you would expect (line two, both right hand columns). The nhaA is not primordial. 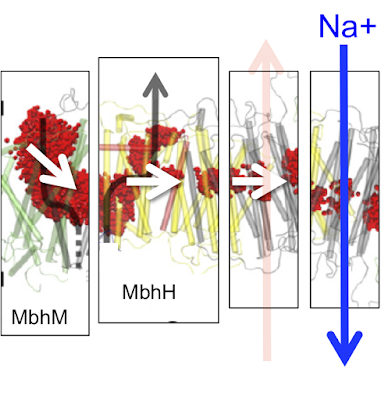 Both of the Mrp type antiporters maintain an intracellular Na+ between 13.4mmol and 16.9mmol, which is "high-but-physiological", using a CCCP proton "leaky" membrane voltage of 15 mV to effectively pump out Na+. Quite how the Mrp antiporters do this is unclear. 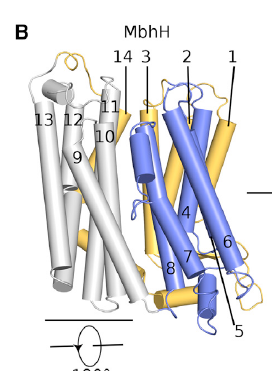 Most of the work has been done on the big subunits, A and D. One is probably a proton channel and one a Na+ channel but even this is not completely clear and in Yu et al's Structure of an Ancient Respiratory System they consider both MrpA and D to have proton channels. So it's messy. 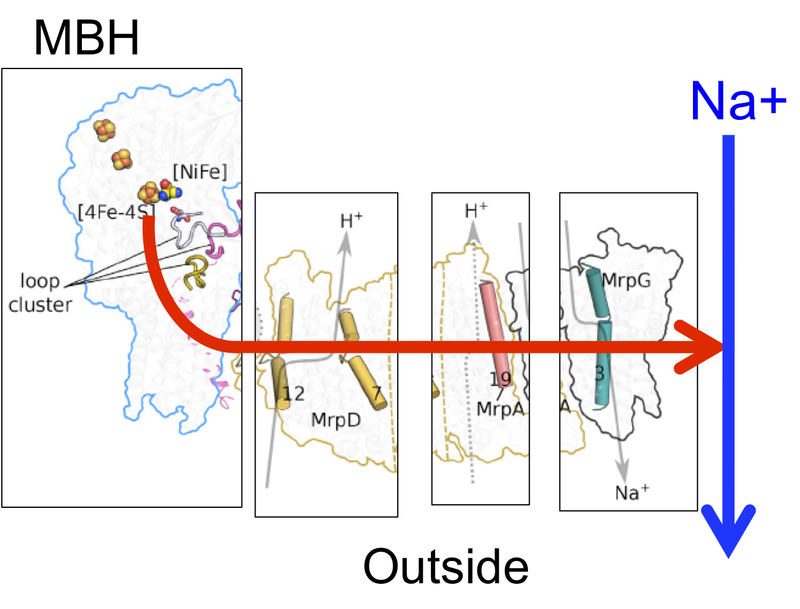 The combined small subunits, MrpE, MrpF and MrpG, plus the tail end of MrpA appear to be a proton/Na+ antiporter in their own right. I'll refer to this section as a "simple" antiporter. Clearly, trying to get a Na+ gradient from a proton leaky membrane by making use of a monogenic nhaA type antiporter doesn't work. Using an Mrp antiporter does. I consider the arrangement in Pyrococcus furiosus is necessary because the cell membrane is permeable to protons. Pump a proton outwards and generally it will boomerang back. Pump it directly in to the mouth of an antiporter and it will return while antiporting a Na+ outwards. The Na+ stays outside. It does this using much of the Mrp machinery. The end game is to drop a precious proton down the throat of the simple antiporter, without losing it through a leaky membrane. 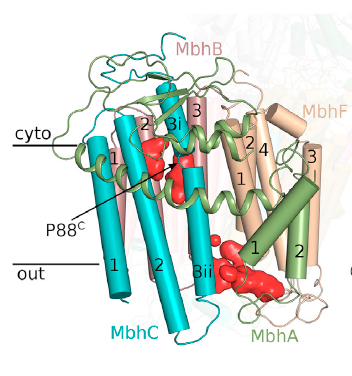 I think the Pyrococcus MBH keeps this proton "in-complex" to avoid losing it. 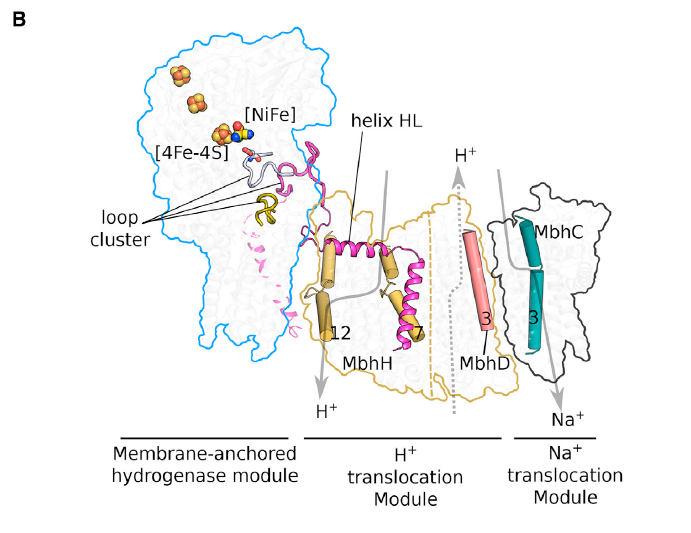 Power is probably supplied to the left hand proton channel from the FeNi hydrogenase by the loop cluster and helix HL. 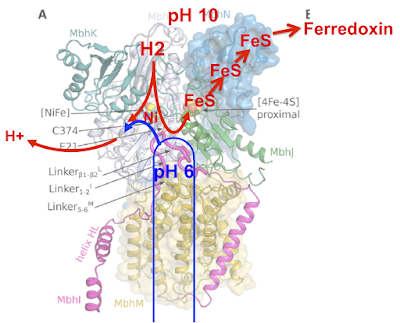 In both diagrams everything is identical to the right of the FeNi hydrogenase or MrpA N-terminal domain. 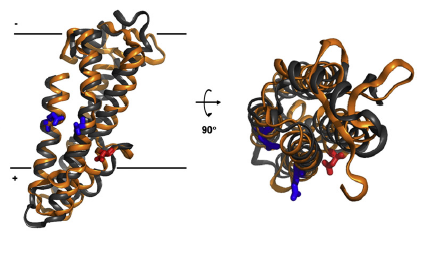 All that differs is the method for "elevating" the guarded proton to the entrance of the simple antiporter on the right. 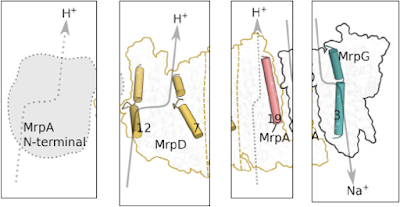 TLDR: Mrp is an adaptation to a failing geochemical proton gradient. 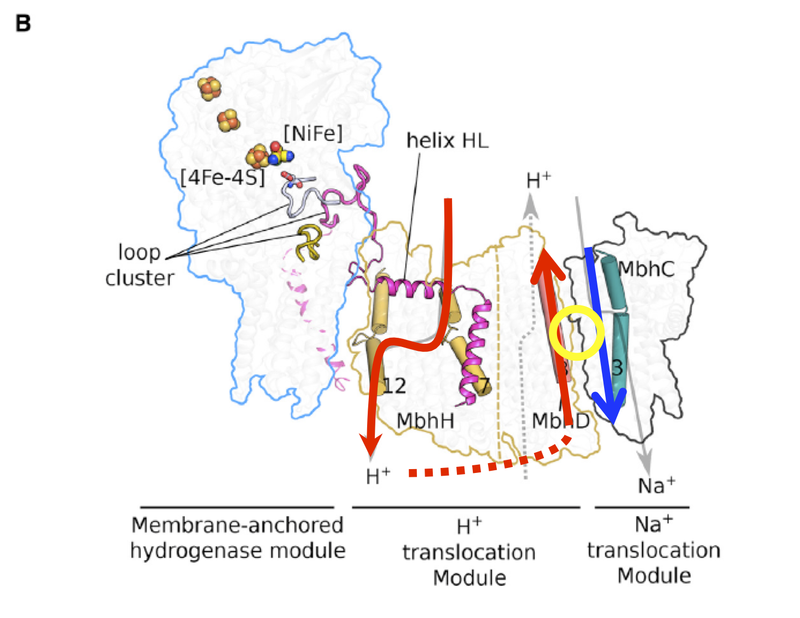 Membrane bound hydrogenase is the adaptation to a failed geochemical gradient. It is amazing to me that Mrp keeps its core function today despite the radically different tasks (saline and alkaline tolerance) which it is needed for nowadays. All we need is a proton leaky membrane to return it to do what it did initially. No change. Okay, it's not an envelope, its the back of a chocolate wrapper. Speculation is such fun, given enough chocolate. 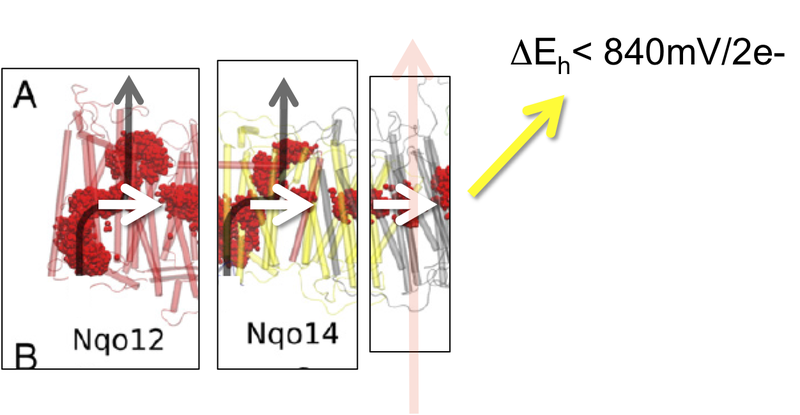 Two protons inwards, two Na+ antiported outwards, what could be nicer? This is the structure favoured by group in Sweden comparing MrpA and MrpD with the antiporter-like subunits of complex I.
I think it might be completely wrong. I like this paper but I'm still left with a niggling thought that having two antiporters in one complex, apparently both doing the same thing, is just a little wasteful. The normal bacterial approach is one where the jettisoning of genes is developed to a fine art. The modern Mrp antiporter is very interesting in it's own right. It needs a little post of its own. "With regard to the most primitive forms of microbial physiology, microbiologists reached the same conclusion 45 years ago , namely that methanogens and acetogens probably represent the most ancient lineages . We required 2000 genomes and powerful computers for our conclusions, while Decker et al. just thought about it. Evidently, just thinking about things can be a source of scientific progress". 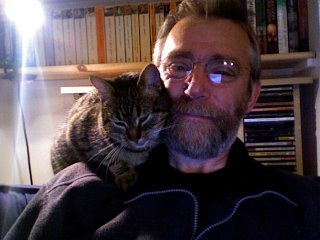 Tom Naughton has a post up which pretty well sums up why I don't use twitter. It also encapsulates why I do respect those people who continue to do so and are willing to endure Twitter Dumb as a result of actively promoting the consumption of Food to crowds with wisdom. As opposed to the Hyperlipid approach of: "Here's the info, do what you like with it". Mea culpa. However, I do feel Tom is a little harsh in places. In particularly he is grossly insulting to the mental abilities of some of the more common root vegetables. If a person in category three of Twitter Dumb has insight comparable to that of a turnip, how does that make the turnip feel? More fascinatingly, how do Twitter Dumb folks survive in the real world? "All organisms must procure energy to survive, and most lack higher-order brain functions that support consciousness". OK, more doodles. More on Yu's paper. Look at those three embedded FeS clusters from the nickel catalytic core to the ferredoxin docking site, perfectly set up for electron tunneling! The H+ exit track is really as shown (though the blue arrow is my guess) and the hollow core of the gold section (MbhM) does connect to the outside. I omitted, by accident, that the track to ferredoxin is that of electrons freed from hydrogen. 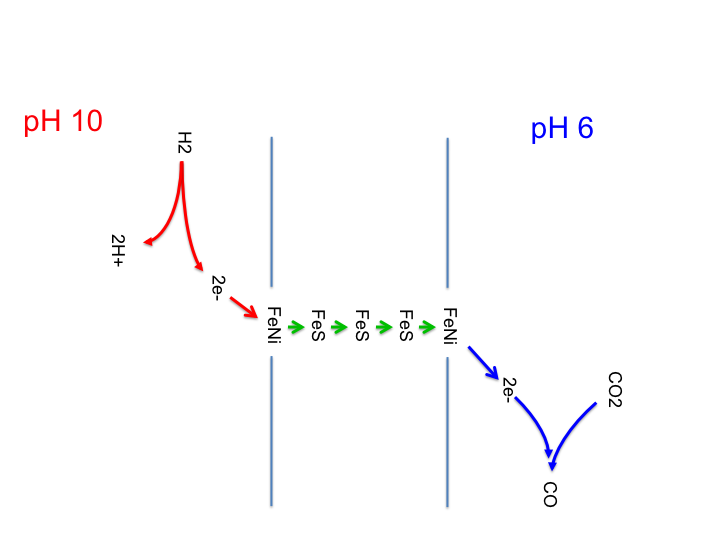 I'm showing the hydrogenase splitting hydrogen as per vent conditions. Nowadays it runs the other way (usually fed on fructose of all things) with hydrogen as waste. Pyrococcus furiosus is an interesting organism. It has a penchant for living in environments at around 100degC. It looks like it has occupied this niche for a very, very long time. 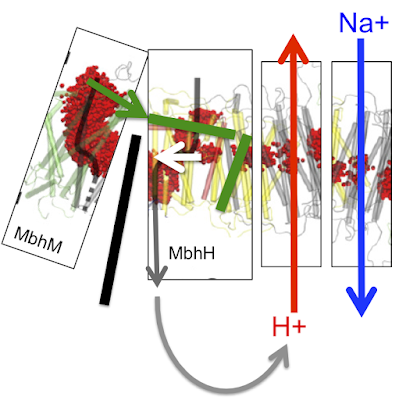 It has a proton permeable, Na+ impermeable cell membrane. At 100degC constructing a proton tight membrane appears to be bloody difficult. At some point Pyrococcus hopped from an alkaline hydrothermal vent to a volcanic black smoker type hydrothermal vent. 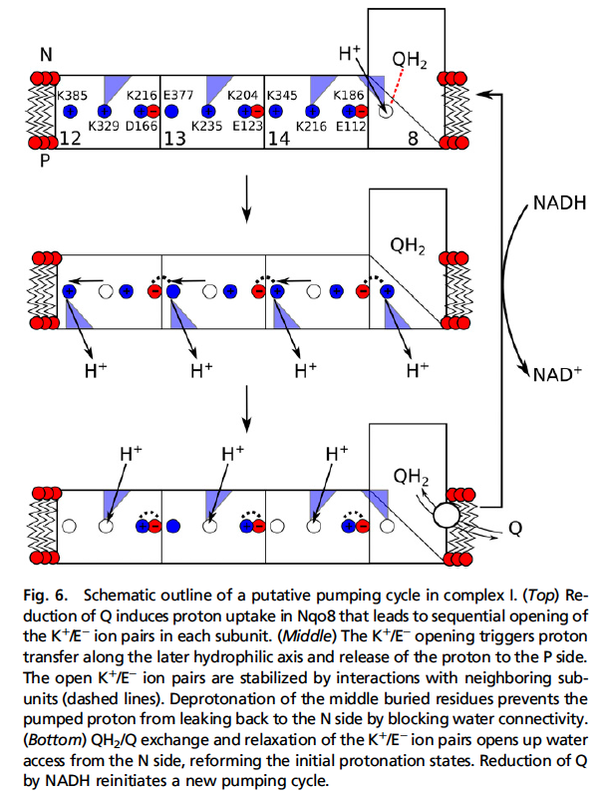 It went, as I've argued, with a proton leaky membrane using Na+ energetics to generate ATP. Given the tools available, how did this work and what do the metabolic fossils look like? An alkaline vent driven proto-Ech is core. 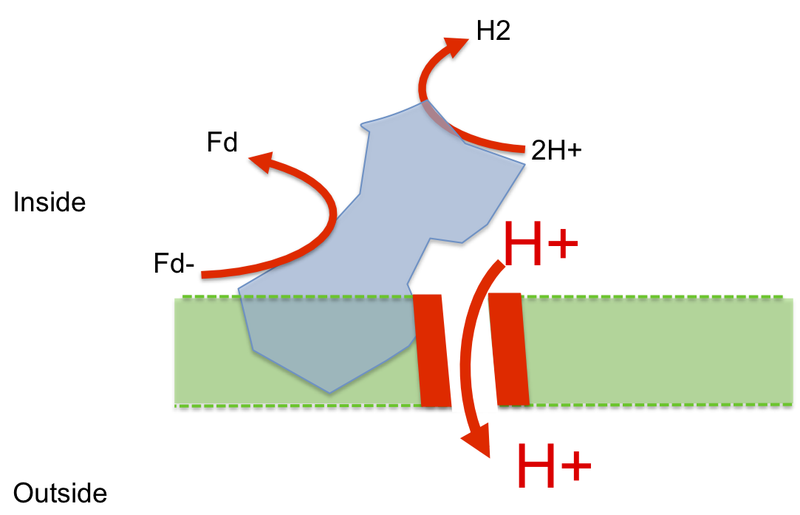 It uses the proton gradient to reduce ferredoxin using molecular hydrogen. Proton (and hydroxyl) permeability is essential to neutralise the entering protons and allow the process to be continuous. At the time I wrote the Life series I felt this was unlikely to be a reversible process. I was wrong, it is. Here is the initial proto-Ech generating reduced ferredoxin using molecular hydrogen, taken from here and here. 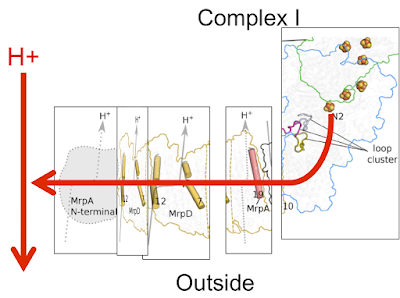 Whatever the initial advantage of extruding Na+ from the cell might have been the major subsequent development was the formation (twice) of the Na+ ATP synthase. 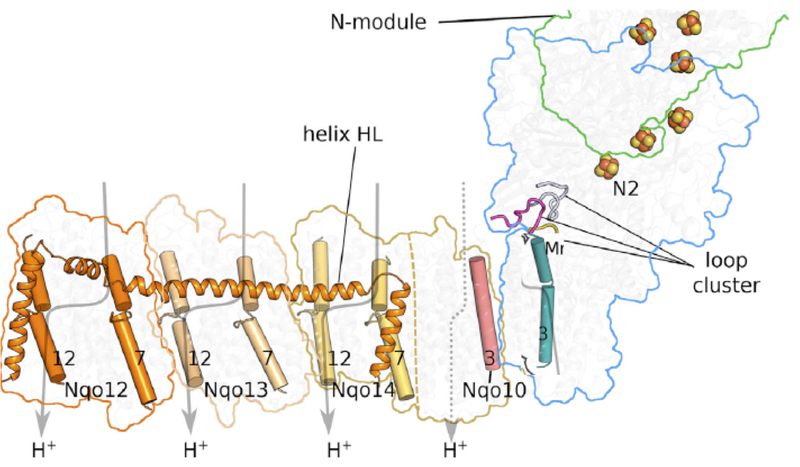 This Na+ ATP synthase is, ultimately, powered by the ocean to vent proton flow and permeability to protons (and hydroxyl ions) is still essential to maintain the influx of protons. 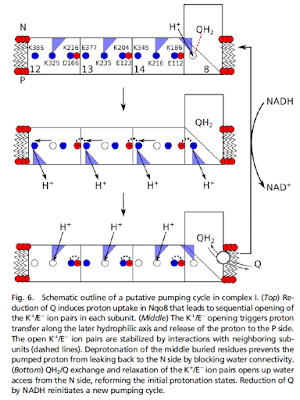 At this time life has available a proton pump, a proton leaky membrane, a proton/Na+ antiporter and a Na+ ATP synthase. There is no point in pumping protons across a proton permeable membrane, especially if you leave the vent and every ferredoxin molecule becomes precious and life must become frugal. 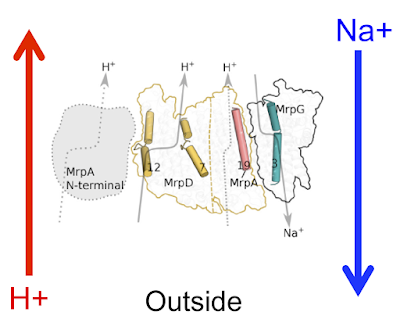 The cell membrane is still proton leaky, Na+ opaque and an Na+ ATP synthase is driven by the Na+ gradient. Like Pyrococcus furiosus today. Does Pyrococcus have this reverse proto-Ech physically coupled to an antiporter? The blue protein is what I've called proto-Ech running in reverse, generating waste H2 from reduced ferredoxin. 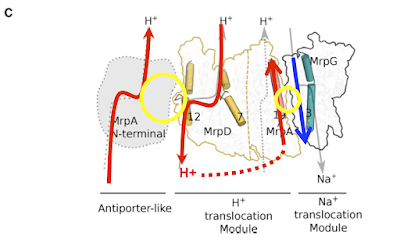 It uses this redox reaction to pump a proton out (downwards) through the left side of the "H+ translocation module" which then (in my head) returns directly (upwards) through the right hand side of the "H+ translocation module" which is the proton half of the antiporter. 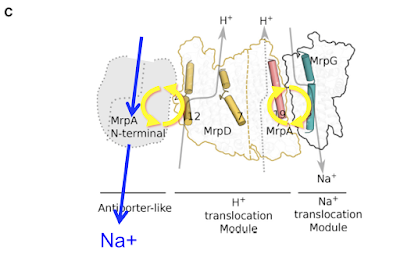 This gives an associated antiported Na+ outward (downwards) via the "Na+ translocation module", second half of the antiporter. This goes off to drive Na+ energetics. Genuine Ech and Complex I are different, they use similar subunits but the redox component is on the opposite end of the intramembrane/antiporter section and this looks to be a later derivative to me, secondary to a proton tight membrane and the change to using proton pumping with blocked Na+ ingression, a far more complex process (accidental pun). And there are other Na+ pumps too. But this one in Pyrococcus, it's the one which should be there. And it is. "No! Carbohydrate restriction is the stupidest approach to fatty liver ever devised. If it “works” in any case it is almost certainly by supplying more methionine and choline, not by lowering carbs. It is impossible to make more fat from carb than you get by eating fat"
I can't help but think "chylomicron", "thoracic duct" and "physiology". Then I giggle some more. I guess it ranks along side of "Masterjohn", "Martha" and "RQ 0.454". Edit on 27th Feb: Published 2 days ago, very post hoc. This is what happens to surrogates for NAFLD when people apply the “stupidest approach to fatty liver ever devised”. "To gain a better understanding of cell metabolism as a function of the growth metabolic demand we performed a back-of-the-envelope calculation focusing on the major biomass components of mammalian cells". In these days of "shotgun metabolomics" two people appear to have sat down with one or more sheets of paper (possibly larger than an envelope, though you can get some quite large envelopes I guess) and have gone back to basic first principles. They then published in a Nature journal. I love this. I feel it rates alongside getting this image published in Cell Metabolism. Glucose drops through glycolysis to lactate at a rate where ATP generation per minute massively outstrips that available from mitochondrial oxphos. 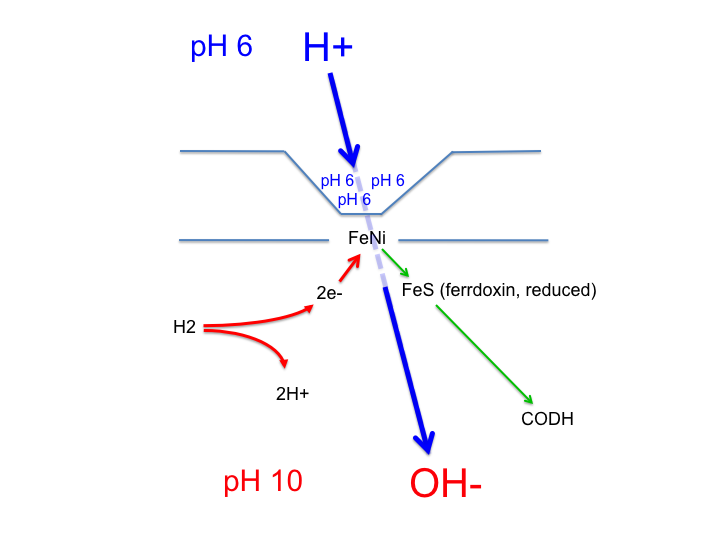 In redox balance. It's fast. Anabolism from glucose consumes pyruvate (and phosphoenolpyruvate) which then forbids the pyruvate -> lactate NAD+ regeneration step. This imposes a need to avoid or deal with a cellular NADH excess. In the Cell surface oxygen consumption (2) post I hypothesised that the regeneration of NAD+ at the cell surface would be in direct proportion to anabolism derived from pyruvate (ie glucose/glycolysis anabolism), to maintain redox balance (ie get rid of excess NADH, cycling it back to NAD+). It is particularly a feature of highly glycolytic cancer cells. These folks appear to be saying the same thing but looking at differing cellular techniques to avoid NADH cumulation. There's lots of other good stuff in there too. Like the rate of mitochondrial ATP generation from HeLa cell mitochondria compared to that of normal cardiac myocyte mitochondria. The ATP production via oxphos is an order of magnitude greater in mitochondria from the cardiac myocytes. "Glutamate can be converted to citrate via reductive carboxylation. 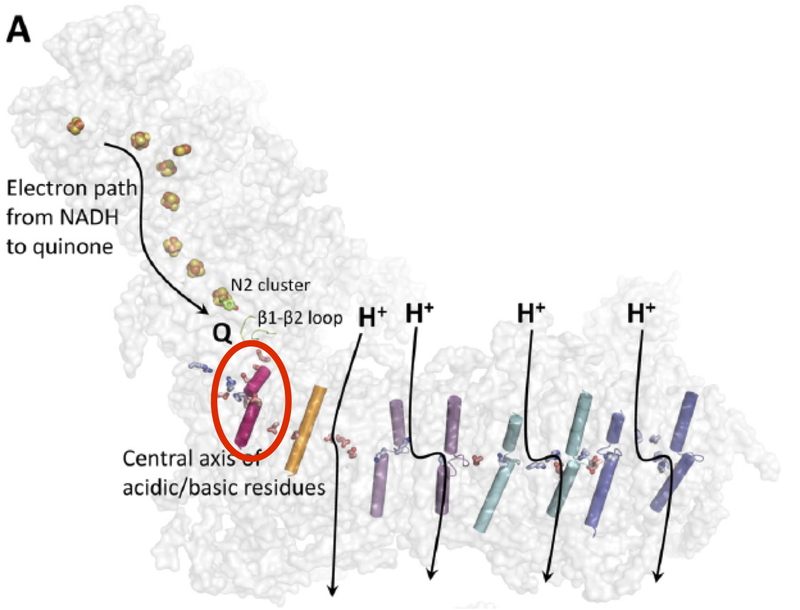 In this pathway the NAD(P)H production by glutamate dehydrogenase is compensated by the reverse activity of the NAD(P) isocitrate dehydrogenase (Fig. 1). Glutamate can be taken from the medium or generated from glutamine by glutaminase. Interestingly, arginine and proline can be produced from glutamate with concomitant consumption of NADH (Fig. 4a). 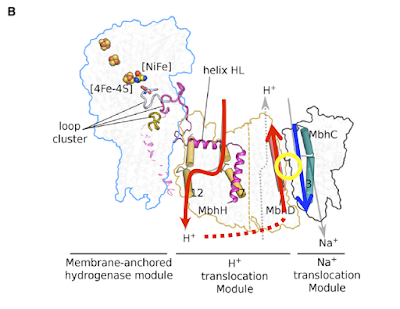 This could provide an additional mechanism for NADH turnover". 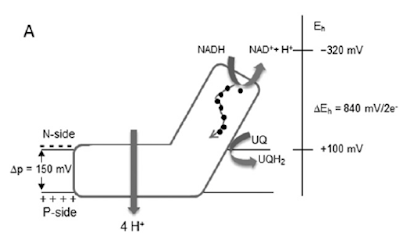 Note that the glutamate is not being oxidised, it is running a small section of the TCA backwards to generate citrate for lipid synthesis, ie anabolism. 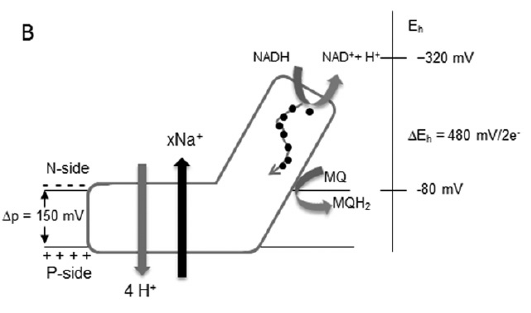 This is not glutamate turning the TCA in the normal direction toward oxaloacetate to generate ATP via NADH and oxphos, because the mitochondria of cancer cells don't seem to do oxphos very well. Somewhat Seyfried supportive. CO2/O2 = 1.0 on average over 24h. If that 24h averaged RQ was all we had to work with we would not suspect that de-novo lipogenesis ever occurred. Nice and simple. Much more difficult to pick up is the bulk conversion of fatty acids to glucose. This produces an unusually low RQ in the short term. But if the glucose is being produced to fuel the brain during starvation then its prompt oxidation would "correct" the unusually low RQ back upwards to a fatty acid RQ. The obvious exception was noted in a metabolically fat adapted and lactating young lady during extended fasting. She made glucose and galactose from fatty acids and gave them to her baby, rather than oxidising the sugars herself. End result was an RQ of 0.454 after just over three days of fasting with continued breast feeding. She was making sugar out of fatty acids in bulk. She might or might not have been doing the same without lactation but in the absence of donating the sugars to her infant this would never show. So the RQ and the FQ always average out to be the same unless something very specific is happening, ie as with Martha. Much more difficult is to ask how do you tell whether glucose is being converted to pyruvate which then enters the mitochondria to join the TCA or whether glucose converts to lactate which is then shipped in to the mitochondria. And what if you have the absolutely crazy idea that glycolysis almost always leads to lactate and that this lactate is a transferable currency between cells? Glucose is then viewed as a one way gift from liver to tissues, to be shared out between cells/tissues as lactate. That latter view has to use tracers to look at lactate or glucose flux. Label some lactate with carbon-13 and infuse it to steady state in the plasma of a mouse. Kill the mouse promptly and humanely and look where the C-13 atoms have ended up in glycolysis and/or TCA intermediates. Repeat the process with C-13 labelled glucose. Then glutamate. And then any other intermediary metabolite which might remotely shift bulk energy around the body. It turns out that in starch fed mice glucose and lactate are the bulk plasma energy carriers, lactate slightly more so than glucose in the fed state and much more so in the fasted state. Certainly on a molar basis, bearing in mind that a mole of glucose has twice the carbon of a mole of lactate, which makes the situation slightly more complex. But lactate labels the TCA more strongly than glucose. Not surprisingly glucose labels glycolytic intermediates better than lactate. Free fatty acids and ketones are a separate subject in high carbohydrate/low fat fed mice but they flux remarkably little energy, at least when fasting is limited to eight hours. Brain metabolism is also another separate subject. Glucose feeds glycolysis to lactate. Most of this glycolytic lactate enters the plasma pool. Plasma lactate feeds the TCA in other cells. "Among the many metabolic intermediates, why does lactate carry high flux? Lactate is redox-balanced with glucose. The rapid exchange of both tissue lactate and pyruvate with the circulation may help to equate cytosolic NAD+/NADH ratios across tissues, allowing the whole body to buffer NAD(H) disturbances in any given location. Nearly complete lactate sharing between tissues effectively decouples glycolysis and the TCA cycle in individual tissues, allowing independent tissue-specific regulation of both processes. Because almost all ATP is made in the TCA cycle, each tissue can acquire energy from the largest dietary calorie constituent (carbohydrate) without needing to carry out glycolysis. In turn, glycolytic activity can be modulated to support cell proliferation, NADPH production by the pentose phosphate pathway, brain activity, and systemic glucose homeostasis. 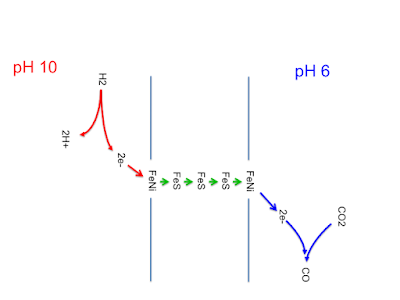 In essence, by having glucose feed the TCA cycle via circulating lactate, the housekeeping function of ATP production is decoupled from glucose catabolism. In turn, glucose metabolism is regulated to serve more advanced objectives of the organism". What I think this is saying is that lactate supplied to the TCA/OxPhos is for "housekeeping" ie ATP production. Glycolysis is for anabolism. Neither is absolute, but I find it an interesting point of view. There is probably significant fudge-room. Lactate: Is the astrocyte-neuron lactate shuttle scuppered? You don't usually learn much from statements which you, personally, consider likely to be correct. Annoying statements are far more productive. "It is glucose and not lactate that primarily drives brain energy metabolism (Allen et al., 2005; Dienel, 2012; Nortley and Attwell, 2017), making it unlikely that lactate could serve as a major energy metabolite for neoplastic GBM cells with diminished OxPhos capacity". Brain activity-induced neuronal glucose uptake/glycolysis: Is the lactate shuttle not required? Labels: Is the astrocyte-neuron lactate shuttle finished? And when you reach the scene of crime - Macavity's not there! But I tell you once and once again, - Macavity's not there! I think people might have noticed over the years that I'm not a great fan of metformin acting clinically by blockade of complex I. Particularly over the last few months I have waded deep through layers of references looking at the morass of "paradoxes" about metformin. In particular that 250micromolar in your plasma will kill you but 4000 micromolar can be justified in cell culture because meformin "accumulates in the mitochondria" at up to 1000 times the level in the blood/cytoplasm, which is a deeply held belief structure on which an unimaginable amount of grant funding hangs. Does metformin cumulate in mitochondria? But when you have spent years slogging through papers thinking: That's crap! it comes as a huge relief to find that it's not just you who thinks this, no matter how politely the reaction is phrased. So. Is metformin research all garbage? No, of course not. Anything involving a live animal on oral doses which do not cause death by lactic acidosis is worth thinking about. Any parallel cell culture research in the same paper using a 4millimolar concentration can be junked. In vivo effects are real, at real dose rates. Cell culture at 1000 times overdose is fiction. 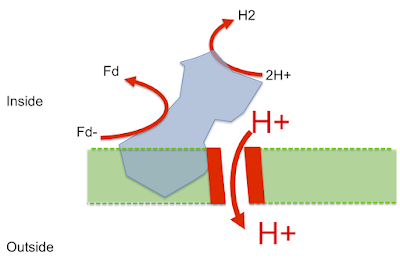 Under fasting the component of insulin signalling facilitated by the glycerophosphate shuttle can be replaced by saturated fatty acid oxidation via electron transporting flavoprotein dehydrogenase. This maintains insulin signalling at the "cost" of increased fat oxidation. Hence the weight loss. In the peak absorptive period after a carbohydrate based meal the normal development of insulin-induced insulin resistance is blunted and glucose oxidation continues for longer than without the metformin. If you are eating the absolute crap suggested by any cardiologist or diabetologist this might be of some benefit. 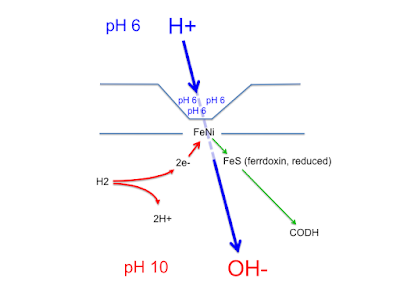 If you are already LC the increased fasting fatty acid oxidation is probably where the benefits accrue from. Cancer benefits are likely to be real, off "target" and secondary to reduced insulin exposure. A certain amount of hydrogen peroxide is also generated and just a little superoxide (probably for cell-cell signalling). 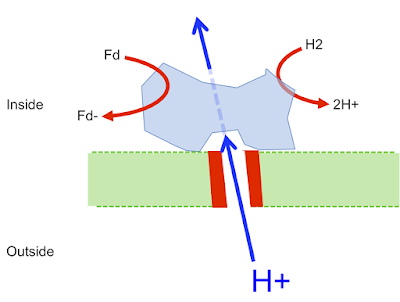 Other electron acceptors can stand in for, or compete with, oxygen as the terminal electron acceptor. The reaction occurs on the outer surface of the plasma membrane. 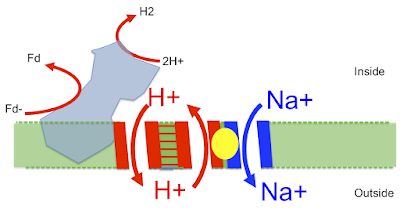 Although I doubt that there is very much NADH or NAD+ in normal extra cellular fluid there has to be an NADH docking site on the outer redox enzyme as one of the hallmarks of cell surface oxygen consumption is that it can be halted completely by flooding the cell culture medium with NADH. 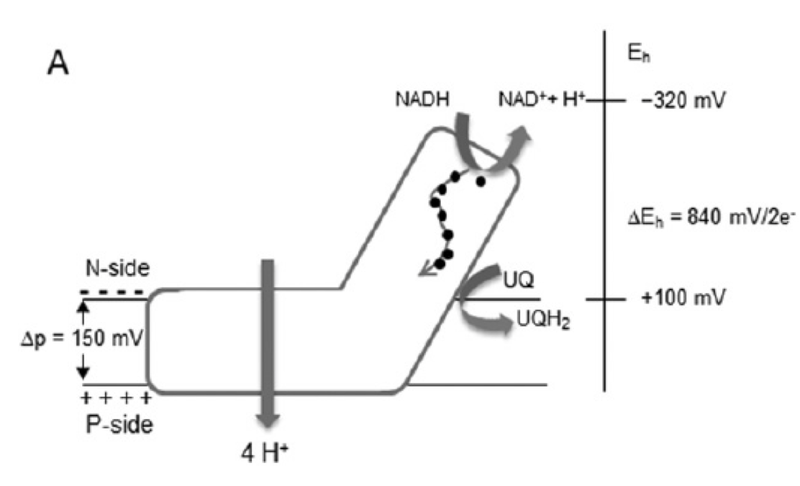 Electrons from this then follow the dashed line to fully reduce the ubiquinone to ubiquinol and the system grinds to a halt. So you can measure cell surface oxygen usage by the fall in consumption which occurs when you add exogenous NADH just as you can measure mitochondrial oxygen usage by the fall in consumption which occurs when you add myxothiazol. Why is the system there? 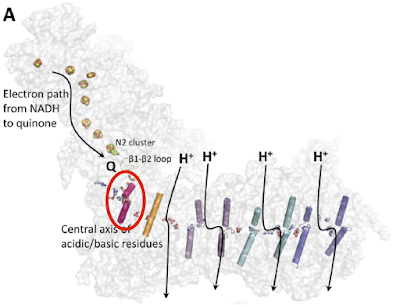 which balances the cytoplasmic NADH:NAD+ ratio nicely. Now, let's consider a cell undergoing rapid growth with a view to divide. For today I will ignore mitochondrial biosynthesis and consider what happens if cytoplasmic pyruvate is consumed for amino acid biosynthesis. For each molecule of pyruvate which has been diverted to an amino acid there will be one less available to provide cytoplasmic NAD+ by conversion to lactate, which will limit glycolysis because cytoplasmic NAD+ is essential for the oxidation of glyceraldehyde-3-phosphate. 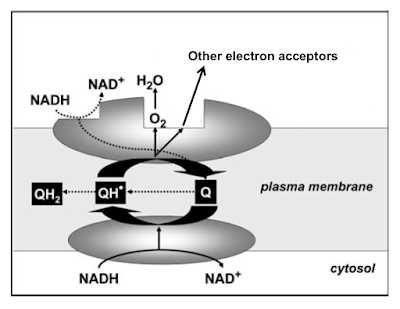 Under these conditions cell surface oxygen consumption appears to be able to step in to oxidise cytoplasmic NADH to cytoplasmic NAD+, which then allows glycolysis and its associated ATP production. This looks to be particularly important if there is any sort of a problem with the ETC and the glycerophosphate shuttle. 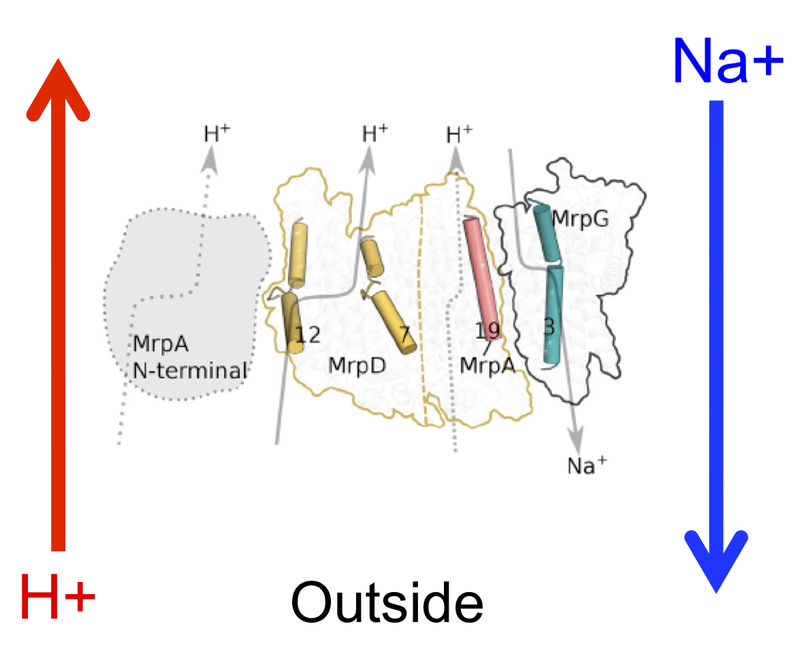 In rho zero cells, where the ETC is deleted (and there is no glycerophosphate shuttle) and glycolysis is the sole source of ATP production, cell surface oxygen consumption has to supply NAD+ in direct proportion to how much pyruvate is lost to anabolism rather than being used to supply NAD+ via lactate generation. In rho zero anabolic cancer cells cell surface oxygen consumption can be as much as 90% of the total oxygen consumption of the parent cell line. TLDR: Anabolism requires cell surface oxygen consumption to regenerate NAD+. Its importance rises if there is defective ox-phos.